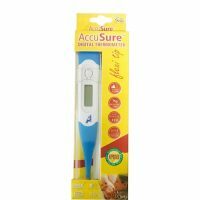 FEATURES: It has an infrared technology that allows you to measure temperature without touching to a body. The device emits a beep sound to indicate the completion of the measurement. It also triggers an alarm when the temperature exceeds. The device has an extreme accuracy as well as really fast reading time-that is 1 second. It has a built-in memory that can store up to 30 test results. Highly accurate and precise readings. Very Fast reading 1-2 seconds. Absolutely no contact with the patient. Both Celcius & Fahrenheit measurements. Suitable for Infants, Children & all types of patients. Ideal for OPD/ Emergencies/ ICU/ Pediatrics Doctor clinic. Easy to operate and carry. WARRANTY: The product is available with one year warranty.